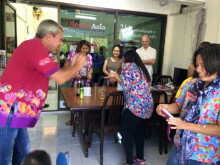 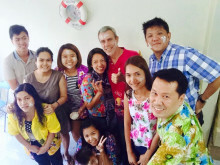 Scand-Media celebrates traditional Songkran - Scand-Media Corp., Ltd.
Scand-Media group staff celebrated on Friday 10 April the Thai Songkran - the Thai water festival held in the middle of April marking the Thai New Year. 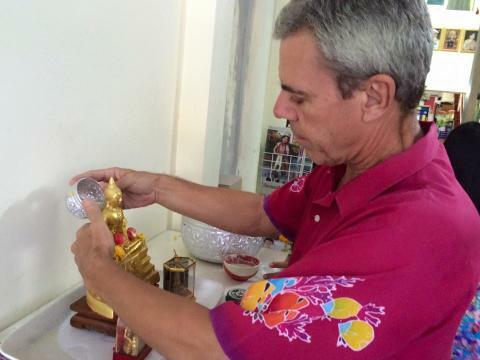 Dousing or sprinkling people with water signifies the washing away of bad thoughts and actions, and brings them good luck in the new year.As a procession and formalities end, a throng forms in the street to dance, party, and throw water in good-natured fun. To up the ante, many Thais add ice to their water or travel in teams that wear masks and carry large water cannons. You probably won't mind the drenching; afternoon temperatures in April regularly rise above 100 degrees Fahrenheit. The first splash mayn be inconvenient, but once you are wet it is indeed fun and a great way to escape the scorching temperatures in April -- the hottest month of the year.